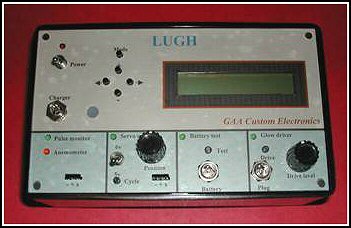 The Lugh is a state-of-the-art electronic device employing advanced embedded control technology. A two line by 16-character display is proved to communicate diagnostic information and measurement results to the pilot. The Lugh’s function is selected by pressing a mode button, this makes it fast and simple to navigate through and select the option you need. The operational parameters of the Lugh can be defined by the pilot, allowing you to customize the Lugh for your application. This configuration information is save in non-volatile memory, so you only need to configure the system once. The Lugh contains a rechargeable battery pack that will provide all the power need for a full day of flying enjoyment! Date and Time: The Lugh contains a time and date clock to provide standard time functions as well as alarm clock functions. You can even use the Lugh as an alarm clock if you like! Take a nap at the field and let Lugh wake you up! Temperature monitor: The Lugh can even monitor the temperature and display in either centigrade or fahrenheit. You can program a temperature alarm limit and the Lugh will warn you when this limit is hit! The Flight timer: A programmable up or down flight timer is provided to allow the pilot to monitor is flight time and alarm you when its time to land. The Lugh will warn you with “beeps” as your programmed flight time limit nears. The Glow Driver: The glow driver allows the pilot to control the drive level, the Lugh will measure the glow plug voltage and current and display the glow plug’s resistance and power consumption. The Lugh also provides a “enable” button that will start the glow plug drive function. The Lugh will automatically shut the driver off after a preprogrammed delay. The Pilot can program this delay time as desired. The Battery tester: The Lugh’s battery test function is more advanced that the normal expanded scale voltmeter. The Lugh provides a programmable battery load, the pilot can set the load to his desired value. The Lugh will measure the battery voltage with and without the load and then calculate and display the battery voltages and the internal cell resistance. Alarm functions are also provided to warn the pilot when the battery condition is marginal. Tachometer: The Lugh’s tachometer function allows the pilot to monitor the engine RPM. The pilot can program the number of prop blades allowing the Lugh to work for most applications. The prop sensor is on the side of the Lugh, requiring you to point the Lugh at the prop to make the measurement. Servo driver/cycler: The servo driver function allows you to plug a servo into the Lugh and control the servo’s position. Lugh will allow you to adjust the position and will display the pulse width that is being sent to the servo. The servo’s current consumption and power consumption is also displayed, and you can control the servo drive voltage! These are very powerful features and this allows you to monitor servo performance and evaluate aircraft linkage efficiency etc. The Lugh can be programmed to cycle the servo between program locations and programmed translation rates. This allows you to test new servos and installations. During this cycle operation servo current is monitored and displayed. I like to use this function when setting up a new aircraft, I document the servo pulse widths needed to achieve the desired throws. Pulse width monitor: The pulse width monitor function allows you to plug the receiver’s output into the Lugh and measure the pulse with that the receiver is sending to the servo. This can be useful for system diagnostics and aircraft setup. If you use the servo driver function to define the pulse widths needed to get the desired flight control throws, you can then use this function to program your transmitter to drive the servos as required. The Lugh can make this measurement to within .5 microseconds, this is one part in 2000 of the standard servo range of motion! Anemometer: By adding an optional sensor you can even use the Lugh to tell you the wind speed! I’m currently looking at several low cost sensors to support this function. The Lugh monitors its internal status and will let you know if any internal problems are detected, Lugh will even let you know when its time to recharge his batteries! I have only built the prototype and I have been using it for several seasons. I do not expect to have this available until late 2005 unless I get a lot of interest. I expect the price to be about $180 for a built and tested LUGH. Let me know if you are interested.